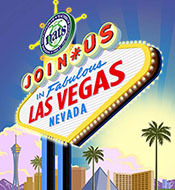 Join us for the 55th NATS National Conference in fabulous Las Vegas. There’s MORE of everything for your enjoyment and enrichment, making this the biggest and most exciting event yet. Re-connect with long-time friends, meet new colleagues, and be inspired as we bring our show to Vegas! The NATS 55th National Conference promises to have something for everyone – teachers, students, and performers alike. The opening ceremony celebrates our singing culture with a first-ever Community Sing, culminating in a celebration of the 100th anniversary of the birth of Leonard Bernstein. We’re pleased to offer a diverse lineup of internationally known performers and speakers, including Broadway performer Alton Fitzgerald White, Metropolitan Opera superstars Stephanie Blythe and Christine Brewer with collaborative pianist Craig Terry, Las Vegas directors and performers, and ”America's Got Talent” finalist Mandy Harvey, who through her invisible disability is making a tremendous impact around the world. We are also honored to have with us Johan Sundberg, one of the pioneering voice scientists of our time. This conference, our largest professional development event, will feature more variety and more members than ever before sharing their expertise in break-out sessions. New offerings include student workshops; mini-recitals exploring American song from Mariachi and Brazil to African American and Creole cultures; informal topical coffee and conversations; and fabulous “Late Night NATS” featuring the Great American Songbook in the Tropicana hotel’s beautiful Havana Lounge. Along with the NSA Finals, we celebrate the future of singing with recitals by the winners of NATSAA, National Music Theater and Art Song Composition competitions. Join us for the ever-popular poster sessions, publisher showcases, and exhibits, and the final evening’s Gala Banquet honoring NATS Lifetime Achievement Award winners.